Ox Lockers are made from some of the strongest materials produced here in the USA. 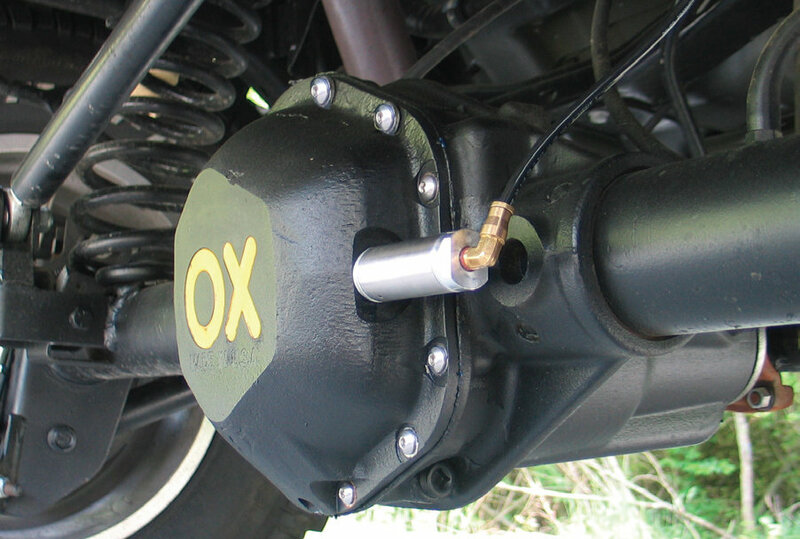 Included with the OX lockers is one of the most rugged heavy duty differential covers on the market, with a lip free design to protecting your vehicle and gears from trail hazards.A four pinion design is used doubling the strength of internal gears. The special back cut locking gear design ensures your locker stays engaged even under extreme torque loads. The included OX air shifter is perfect for the enthusiast with onboard air. The system features a simple dash mount pneumatic switch (no electric) and a mini stainless steel pneumatic cylinder that mounts directly to our heavy duty differential cover. The air cylinder actuates the lockers internal mechanical shift system. No electric necessary (that means more reliability) A very low volume of air is necessary, so, a tank, co2 bottle, or compressor can be used, 100 psi is recommended, and system does retrofit.Made in the USA! The thick machined differential cover material acts as a platform from which the fork engages the locker and its super tough design protects your pumpkin from trail hazards. There's also a threaded drain plug to simplify fluid changes. The Ox Locker System is aircraft quality CNC machining at it's finest. This technology has withstood the test of time in rigorous off-road conditions and is now available to the consumer. The Ox Locker System will engage every time on demand. Shift Actuation Systems and Cables are required and purchased separately. Made in USA. Lockers are made of 8620 forged and heat treated steel. Four spider gear design on all OX Lockers. Forged Steel Ramped Differential Cover. "Back Cut" gear tooth design for locking ring and locking gear.